This week, Patrick Dangerfield comes up against his worst team by a mile to score Fantasy points against in St Kilda. This shocks me, but the stats here do not lie. Over his career, Dangerfield has played the Saints 14 times. From those 14 games he has only registered 2×100+ scores. However, St Kilda have given up the second most points this year behind Essendon which indicates that he should be fine. Last week, Luke Dunstan played his first game for the year and was given the job of tagging Rory Sloane (67pts). There is a very good chance that he might be given the same role this week. Dangerfield has been very solid since returning from a hamstring injury that kept him out of round one with scores of 102 and 118. Look, we know he’ll be fine and should score an easy ton, but this team for whatever reason are a team that he has had massive troubles with in the past. On the flipside to Dangerfield, Lance Franklin LOVES playing the Bulldogs and has clocked up 7×100+ scores against them in his last 8 games. He has scored 101 and 127 in his last two games against them and after starting the year with 151, he has scored 102 and 91 since. Buddy will be in my top 5 this week and he doesn’t mind Etihad either where he scored 90, 99 and 127 last year. 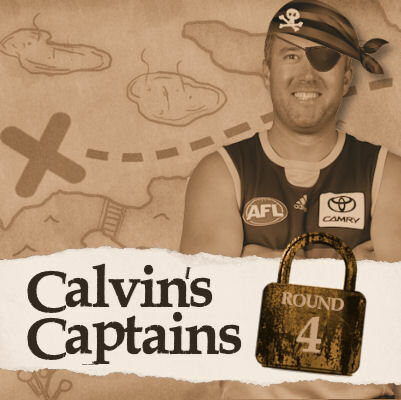 He’s a gutsy captain call, but might reward the brave with a thumper. Fact: Collingwood give up the most points to opposition midfielders. This has been the case for a number of years and this year it rings true more than ever. Enter the Crows… at home. Bryce Gibbs is ranked at #3 on form at the moment with an average of 127 and posted 98 on the Pies last year (as a Blue). His form alone is all you need to look at here, and I am expecting a huge game from him on Friday night. Taggers slaughter Rory Sloane and he was held convincingly to just 67 last weekend. Greenwood had is measure last time (47pts) these teams met although I don’t think Greenwood will play this week. He’s still way too risky and certainly a guy I will be avoiding. Rory Laird sits behind piggy Mitchell on form and has a lowest score of just 120 this year. He has been on fire but his record against the Pies is shocking. Over his career he has played them 5 times and over this time he hasn’t record a single ton. That will change this week. Yes, he is continuing to do what he does best at an average of 147 if you don’t mind. This week he is up against the Demons, a team he has scored a ton on in every game he has played against them. Yes, that’s correct. Tom has played Melbourne four times and has record triple figures each time, with 136 last year. Melbourne do rank as the second hardest team for midfielders to score against though, and the hardest and most restrictive team in general… but we shouldn’t be concerned one bit. This guy is a superstar and will be again this week on Sunday afternoon at the MCG. Mitch Robinson is coming your way and will tag Dusty Martin this week. Robbo tagged him before to a score of 63 and last year when Robbo wasn’t playing the Lions tried to use Robertson on him, which didn’t work as Dusty went on to score 131. This tag will happen… but can Robbo make it effective? Dusty is coming off a score of only 67, his worst score since that tagged game of 63 back in 2017. However, I’m not overly concerned, but concerned enough not to feature the great man in my top five this week. Stephen Coniglio v Fremantle @ NSWS: Cogs had 111 last week, his worst score for the year. Posted 104 on the Dockers last year and should be great at home. Steele Sidebottom v Adelaide @ Adelaide Oval: Adelaide are his favourite team to play in his career and goes for his 7th straight 100+ score against them here. Posted 116 on them in 2017 and has a lowest score of 107 at Adelaide Oval in his last four games. Nat Fyfe v GWS @ NSWS: Hot form with scores of 144 and 123 in the last two weeks and even had 120 against the Giants last year. Bang! Adam Treloar v Adelaide @ Adelaide Oval: Has scored 119 and 121 in his last games against the Crows but is coming off scores of 84 and 90. Just not himself at the moment. Lachie Whitfield v Fremantle @ NSWS: Tagged to 65 last week, and is this a thing that will happen again? Brodie Grundy v Adelaide @ Adelaide Oval: Been on fire with scores of 141 and 127 and even had 108 and 134 on the Crows in his most recent runs. Jarryd Lyons v West Coast @ Optus Stadium: 151 and 134 in his last two games and will continue that form again against the Eagles. Lachie Neale v GWS @ NSWS: 106 and a huge 169 in his last two against GWS, but his 93 last week is a turn off. Stef Martin v Richmond @ the MCG: 177 last week against a ruckless Port, that’s 109pts more than he scored in round 2. Also has 3×100+ scores against Richmond in his last four games. Jack Macrae v Sydney @ Etihad Stadium: 1% ownership for this jet who has scored 116 and 134 in his last two games. Had 105 and 92 on the Swans last year, but as the GWS boys found out last week, Sydney can be restrictive. Josh Kelly v Fremantle @ NSWS: 88 last week and only 91 on the Dockers last year who are his worst team to score against. Kelly has scored 100+ on every team in the competition, but not once against Freo from 5 games. Jack Steven v Geelong @ GMHBA: Running hot with an average of 115 and scored 87 on the Cats last year. Scooter Selwood might wrap him up this week though. Prediction for Tom PIG Mitchell? Any of them worry anyone ? Not expecting a huge Cripps score. Are they the know tag gets this year ?? Whitfield may go to half back so he will rely on the forward pressure from Cerra or Ballas to keep him in check. If you could pick up any mid other than Titch, Gibbs or Coniglio who would you all go for? Price doesn’t matter. I’d throw in Kelly too, but he’s been named out this week; can’t get a read on Martin get if this might be a down year compared to last year. can’t fault Fyfe for his last two games, but recognize how hes’ had to play at the top level to yield great scores. I’d prefer players playing a little bit more ‘piggish’ to get to those scores, like Adams in his prime. Which premium midfielders should I trade in for Merret. Im thinking Jarryd Lyons or Jack Macrae. Can afford any.